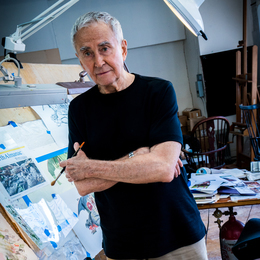 At 83, Charles Santore continues to build upon a decades-long career as one of the Greater Philadelphia Area’s most celebrated illustrators. Charles Santore was four years old when his aunt gave him a modest paint set. He had no way of knowing it at the time, but the gift would have a profound influence on his life—leading him down a path that, nearly 80 years later, would find him regarded as an illustrator of international renown. He took his teacher’s advice and didn’t look back. In 1956, he graduated from the Philadelphia Museum School of Art, now The University of the Arts. He then embarked on what would become a long and celebrated career as an illustrator. In the 1970s, he was doing covers for the nationally circulated and locally published TV Guide, which at the time had more than 20 million weekly readers. As his reputation grew, so did his portfolio. He illustrated book jackets, album covers, and calendars, and he contributed to such respected magazines as Time, Life, Ladies Home Journal, Good Housekeeping, and Esquire, among others. Some of his greatest successes came from illustrating children’s books; he did his first children’s book in 1985—Beatrice Potter’s Tales of Peter Rabbit—and, more than 30 years later, he’s still at it. So far, Santore has illustrated more than 20 children’s books, with more to come. He’s even written and illustrated a few books containing original stories of his own, including William the Curious: Knight of the Water Lilies. His work has earned him wide critical acclaim, as well as prestigious awards such as the Society of Illustrators Award of Excellence, the Hamilton King Award, and the Philadelphia College of Art Alumni Award. Also, earlier this year, the Woodmere Art Museum in Chestnut Hill hosted a comprehensive retrospective exhibit of his work, Charles Santore: Fifty Years of Art and Storytelling, which included some of the memorable TV Guide covers and many of his more fantastic children’s book illustrations. In addition, Woodmere guests will be able to view his watercolor paintings used to illustrate the book The Night Before Christmas through the 2018 winter holidays. Success aside, Santore doesn’t consider himself an artist. His illustrations frequently depict animals and other denizens of the natural world, realistically rendered, but with a pronounced fantasy bent. He has an extensive library containing pictures of his subject matter—trees, mountains, streams, etc.—which he still refers to when needed. Being a good illustrator requires one to be able to draw, but Santore believes that in order to draw well, one must first be able to see.